Sunflower Stamper: Sneak Peak-Autumn Days!! Another sketch completed (yeah me!! )-this one for Stamping 411's Saturday Sketch. For this one, I used a new set, Autumn Days, and some new In Colors! I'm liking them!! 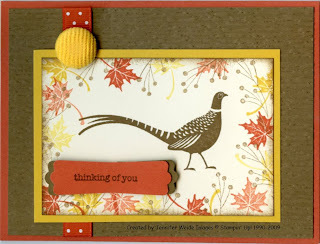 This card has the feel of fall, but could be used year round for a masculine card! Card base is Dusty Durango, background is Soft Suede, Images on Whisper White. The layer behind the pheasant is Crushed Curry. See that ribbon?? The new In Color ribbon is grosgrain-with dots! Love it! More samples using the ribbons in the near future! The background is textured using the Big Shot and the Texturz Plates (Kit #4). I stamped the pheasant in Soft Suede, then stamped the leaves randomly around using Dusty Durango and Crushed Curry. I stamped some full strength, some off once. The other stem image was added last using stamped off Soft Suede. Sponge Soft Suede around the edge to finish it. The "thinking of you" is from the new set, Teeny Tiny Wishes. The new Modern Label Punch was used (twice) and layered on with dimensionals. The button is Summer Sun, but looked just fine with the Crushed Curry! This is the set I will be using for the Royal Blog Tour on July 26-28. Mark your calendar! You won't want to miss ALL the great samples that will be shared! More details in my side bar. AWESOME! Love your card, it's great! I've got to play with the new colors...have been lagging behind :( Thanks for the peek!!! This is simply fantastic card, I have that set on order and hope to have my hot hands on to it! TFS and the inspiration! Hugs always! Lovely card...like the way we can both use the same stamp and it looks so different. This is gorgeous. Awesome use of this new stamp and color set. Gorgeous card! Those colors do look like fall! Jennifer...I love your card! Now I'm wishing I'd have preordered that set! Great job with the challenge this week.